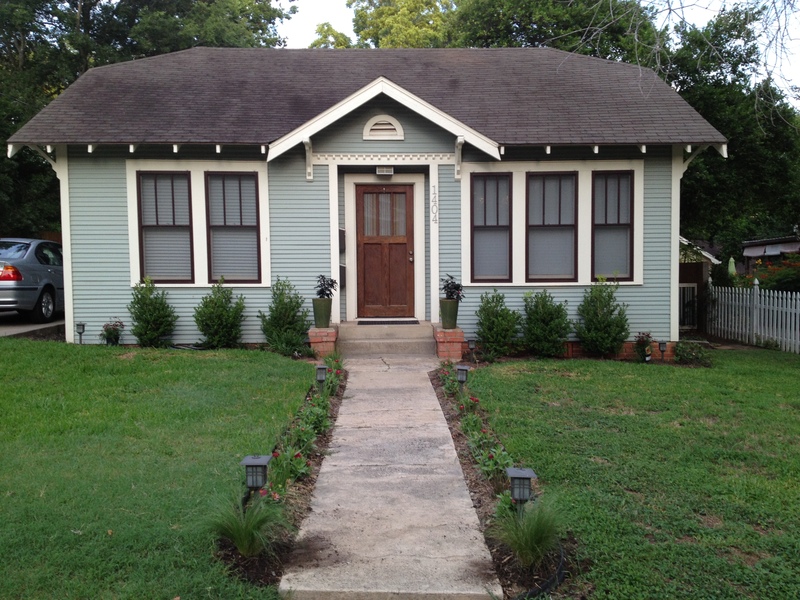 The little house in Brenham, early summer 2012. The first time we stepped into the little house in Brenham with a real estate agent, our reaction was quick: cute but way too small. Tiny kitchen. No dishwasher, and nowhere to add one. One long narrow room in the front that would have to suffice for living and dining. Two bedrooms, both about 10 x 12 feet. Two baths, not unusably tiny but not up to our citified standards in the tile, fixtures and finishes dept. It was under contract, anyway. The next time we visited, that contract had fallen through, and our agent, whose name was Boo (no kidding) persisted. “Let’s just take a quick look,” he coaxed. We liked the big yard — about 8,000 square feet –almost twice as big as our Houston lot. It gave us a nearly blank slate for a new garden, with a big ol’ pecan tree out back, some gargantuan shrubs that turned out to be winter jasmine and two trees we thought were big limes along the driveway, and some ill-placed boxwoods, hawthorns and nandinas in the front yard, where the 2011 drought had pretty much decimated the grass. The big deck and the view out the kitchen window also appealed. So did the shed out back, which could be converted into a studio for Don. View out the kitchen window shortly after move-in. The kitchen was kind of darling, with a few craftsman details in the woodwork and glass front cabinets, plush niches up top where I could display our heirloom teacups and pots. Did we really need a dishwasher? The floor plan wasn’t bad, actually – the two bedrooms and baths were at opposite ends of the house. There was a nice breakfast room. The place had a gazillion windows, so it could be bathed in natural light. The laundry ‘room’ conveniently occupied a long, narrow hall closet. The front bedroom, which we began to envision as my office and a guest room, had a big walk-in closet. The biggest plus: We could pay cash for it, which meant freedom from a house payment and property taxes that had become a big burden. Flash forward a year and a few weeks… We bought the little place last September – right around Labor Day – sold the Houston home we’d lovingly tended for 15 years and moved to the country on Memorial Day. We are adjusting to a new life in a small town midway between Houston and Austin, living in half the house with twice the yard we once had. There are days when I think we’re in heaven and days I want to bust out walls with my elbows. Come back often and share your thoughts with me as we explore the pains, the pleasures and the process of learning to exist with less. Less stuff, less stress. Did I mention the other great thing? Our front door faces east, an optimistic direction. 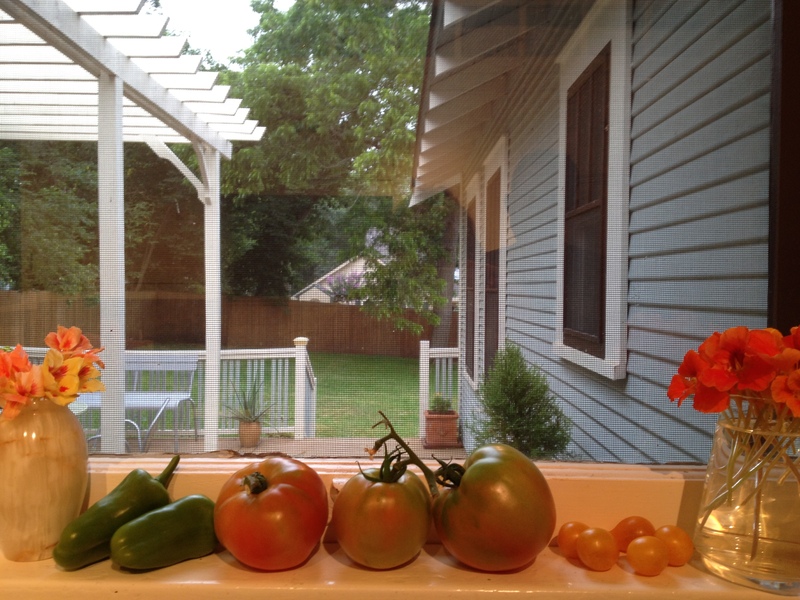 This entry was posted in Little Lessons and tagged DIscover Brenham, garden, living with less, small, tiny on September 22, 2012 by Molly Glentzer.